I love to watch C-span Book TV. Today, David Oshinsky, the winner of the 2006 Pulitzer Prize for History, was discussing his book, Polio: An American Story, 2005. His talk was fascinating. He describes the fear that haunted parents during the summer months when polio stalked children and young adults. The extraordinary efforts a new kind of philanthropy organization, the March of Dimes, resulted in funding for research and a race for the vaccine between Jonas Salk and Albert Bruce Sabin. Oshinsky thoughts on how FDR caught the disease were very intriguing. Happily polio is practically a thing of the past now in the United States. He discussed the efforts of Rotary International to eliminate polio by the year 2010 by supplying vaccine to places in the world where polio still exists. The whole subject has a great deal of personal resonance for me. My father contracted polio when I was two years old. My folks have suggested that I may have even been the carrier although I never developed the disease. (Gulp!) We have a family friend who works for the March of Dimes and family and friends who are involved in Rotary. This is an extremely interesting program! Children's author Peg Kehret contracted polio as a child and recounts her story in the moving Small Steps: The Year I Got Polio, 1996. Kehret describes her illness from the onset to recovery. The emotional and physical challenges she faced make this an engrossing read. Girls, especially, are often fascinated by this title. I highly recommend this book. 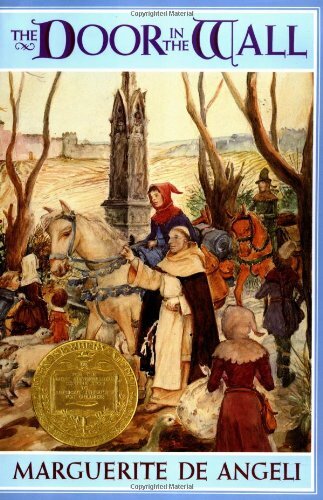 This is one of those books that I always noticed on the shelf of the library when I was a kid but I never picked it up to read until I was school librarian. Robin's father is a knight and his mother is a lady in waiting to the queen. His parents are away as the story opens and he has been abandoned by his caretaker while suffering from a devastating illness. Luckily a kind friar, Brother Luke, arrives to take care of him. The disease has left Robin crippled and unable to use his legs at all. Reading the book as an adult it was apparent to me that young Robin has survived polio. Even though the setting is the Middle Ages, De Angeli was writing in 1949. There are images of polio treatment throughout the story: Brother Luke massaging and exercising Robin's legs in a kind of physical therapy, Robin swimming to build strength (like FDR at Warm Springs, GA) and learning to walk with crutches. Robin discovers he can still serve his country when danger threatens, despite his handicap. I think I have a copy of The Door in the Wall, but I've never been able to make myself read it. I never read it until I was an adult. I've never seen a kid read it. The "polio" aspects are what I remember. I don't recall too much about the plot i all honesty. I read "Small Steps" while I was a 4th grade teacher. Many of the kids read the book that year and loved it, too. It is an interesting, inspiring story! Also, a great way to get kids to read Peg Kehret's other books. Good recommendation! I read The Door in the Wall aloud to my kids several years ago - they loved it.